The Seattle Shakespeare Company has moved into the Cornish Playhouse (nee The Intiman) to wrap up their 24th season with a stirring Othello. The big doings of the play work well in this larger venue. Energy sizzles here from the opening curtain and director John Langs is able to keep this most tightly knit of all Shakespeare’s tragedies building and building toward its devastating climax. 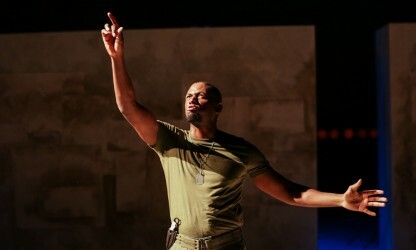 Sean Phillips is a more than able Othello, most notably hitting the high notes of the distraught, jealousy ravaged general of the latter scenes. Darragh Kennan offers a nicely nuanced Iago, impishly pulling all the right strings to bring his comrades down to the unimaginable torments he has planned. But this show really belongs to the women: Hillary Clemens as Othello’s wife Desdemona and Alexandra Tavares as Iago’s wife Emilia. Clemens is wonderfully charming in her opening scenes, flirting with her older husband. One can easily see why Othello would fall for her. When she is falsely accused of cheating on him, her confusion and anger are focused and most effective. Tavares displays an earthy, natural charm and comes off as the smartest character on the stage as a poised and worldly Emilia. Our only mystery here is how such a together woman could ever fall for the twisted Iago! The scenes between these two very different women become a central focus of the evening. Langs came up with a plateful of inspired directorial choices for this production. All the opening scenes occurring in Venice take place downstage in front of the grand drape. It is only when the characters make their ill-fated trip to Cypress that the curtain rises, displaying the much more ominous foreign land. Cassio (Quinn Franzen) is often the golden boy of the story, but here we have hints his character is a bit too much of the ladies man, justifying Iago’s complaints that Cassio is not deserving of the lieutenancy bestowed upon him by Othello. Trick Danneker as Roderigo is a hoot, fussily pouting when he can’t get the girl of his dreams. The drunken brawl scene makes for an early highlight, playing something like an outtake from Animal House. Later in the play, Othello’s torment over losing Desdemona is enhanced by the use of eerie lighting designed by Geoff Korf. While the opening scenes may have a bit too much shouting from some of the supporting characters, the play quickly finds its groove and goes on to provide a real emotional wallop. Seattle Shakespeare can be proud of its stellar production of this demanding tragedy. Othello runs through May 17 at the Cornish Theatre at Seattle Center. For ticket information call 206-733-8222 or go to www.seattleshakespeare.org. Seattle Shakes does not Stoop but it does Conquer !!!!!!!!! !